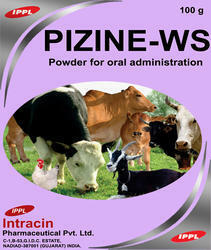 Pioneers in the industry, we offer powder for oral administration, chick formula, flumequine powder, sulfadimidine powder, hydrodispersable sulfa powder and amoxycillin trihydrate from India. Preventive : 1 g per 50-100 kg body weight through drinking water or milk for 21 days. Curative : 5 g per 25-50 kg body weight through drinking water or milk for 5 days. For meat: Calves, Sheep and Goats : 14 days. A broad-spectrum antibiotic with essential vitamins for control and prevention of specific diseases in growing Chicks. Day old periods: Add 5 g to each 5 lt. of drinking water for one to two weeks. Stress Periods: To maintain appetite at vaccinations, during extremes of temperature and other upsets, use at the rate of 5 g to each 10 lt. of drinking water. Start this treatment two days before vaccinations or planned feed change and continue for seven days. At times of sickness: Add 5 g to each 5 lt. of drinking water and continue treatment for seven days. To prevent Vaccination Stress: Give chicks solution containing 5 g to each 10 lt. of drinking water for two days before and seven days after all vaccinations. Laying Hens : Add 5 g to each 10 lt. of drinking water for four weeks followed by 5 g in 50 lt. of drinking water daily. Gastrointestinal, respiratory and urinary tract infections caused by flumequine sensitive micro-organisms, like Campylobacter, E. coli, Haemophilus,Pasteurella and Salmonella spp. in Calves, Goats, Poultry, Sheep and Swine. Calves, Goats and Sheep : Twice daily 10 g per 75 - 150 kg body weight for 3 - 5 days. Poultry and Swine : 1 kg per 1000 - 2000 lt. of drinking water for 3 - 5 days. Administration to animals with a seriously impaired hepatic and/or renal function. Concurrent administration of tetracyclines, chloramphenicol, macrolides and lincosamides. Calves, Goats, Sheep and Swine : 8 days. Gastrointestinal, respiratory and urogenital infections caused by sulfadimidine sensitive microorganisms like E.coli, Staphylococcus, Streptococcus and Pasteurella spp. in Calves, Cattle, Goats, Poultry, Sheep and Swine, and coccidiosis caused by Eimeria spp. in Poultry. 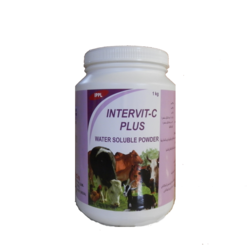 Calves, Cattle,Goats and Sheep : 10 g per 100 kg body weight for 3 - 7 days. Swine : 1 kg per 2000 lt. of drinking water for 3 - 7 days. Poultry : 1 kg per 2000 lt. of drinking water for 3 days or according to the 3-2-3 scheme: 3 days on, 2 days off, 3 days on. Administration to animals with a seriously impaired renal and/or hepatic function, or with blood dyscrasias. For meat: Cattle, Calves, Sheep, Goats : 12 days. Poultry and Swine : 15 days. For milk : 5 days. 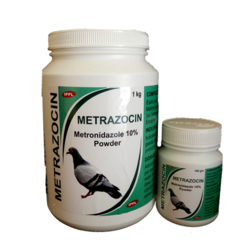 Gastrointestinal and respiratory infections caused by trimethoprim and sulfadiazine sensitive micro-organisms like E. coli, Haemophilus, Pasteurella, Salmonella, Staphylococcus and Streptococcus spp. in Calves, Sheep, Goats, Poultry and Swine. Calves, Goats and Sheep : Twice daily 5 g per 100 kg body weight for 4 - 7 days. Poultry and Swine : 1 kg per 1500 - 2500 lt. of drinking water for 4 - 7 days. Hypersensitivity to trimethoprim and/or sulphonamides. Administration to animals with a seriously impaired renal and/or hepatic function or with blood dyscrasias. Calves, Sheep, Goats and Swine : 8 days. Gastrointestinal, respiratory and urinary tract infections caused by amoxycillin sensitive micro-organisms, like Campylobacter, Clostridium, Corynebacterium, E. coli, Erysipelothrix, Haemophilus, Pasteurella, Salmonella, penicillinasenegative Staphylococcus and Streptococcus spp. in Calves, Goats, Poultry, Sheep and Swine. weight for 3 - 5 days. Poultry and Swine : 1 kg per 1000 - 2000 litres of drinking water for 3 - 5 days. Hypersensitivity to amoxycillin.Administration to animals with a seriously impaired renal function. 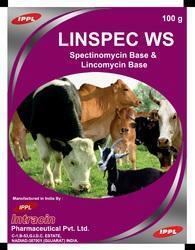 Concurrent administration of tetracyclines, chloramphenicol, macrolides and lincosamides. Gastrointestinal infections caused by colistin sensitive bacteria, like E. coli, Haemophilus and Salmonella spp. in Calves, Goats, Poultry, Sheep and Swine. Calves, Goats and Sheep : Twice daily 5 g per 100 kg body weight for 5 - 7 days. Poultry and Swine : 1 kg per 1000 - 2000 lt. of drinking water or 500 - 1000 kg of feed for 5 - 7 days. Administration to animals with a seriously impaired renal function. Administration to animals with an active microbial digestion. For meat : 7 days. 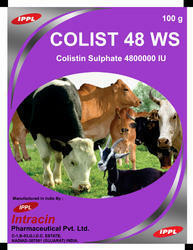 Colistin sulphate 4 800 000 IU. Gastrointestinal infections caused by colistin sensitive bacteria like E. coli,Haemophilus and Salmonella spp. in Calves, Goats, Poultry, Sheep and Swine. Calves, Goats and Sheep :Twice daily 1 g per 80 kg body weight for 5 - 7 days. Poultry and Swine : 1 kg per 4000 - 8000 lt. of drinking water or 2000 - 4000 kg of feed for 5 - 7 days. Calves,Goats and Sheep :Twice daily 1 g per 20 kg body weight for 4 - 5 days. Poultry : 1 kg per 2000 lt. of drinking water for 4 - 5 days. Swine : 1 kg per 1000 lt. of drinking water for 4 - 5 days. Note: For pre-ruminant Calves,Lambs and Kids only. COLOXY WS is not for use in animals from which milk or eggs are produced for human consumption. Administration to animals with seriously impaired renal and/or hepatic functions, animals with an active microbial digestion or animals producing milk or eggs for human consumption. Concurrent administration of penicillins, cephalosporins, quinolones and cycloserine. For meat: Calves, Goats and Sheep : 14 days. Gastrointestinal, respiratory and urinary tract infections caused by amoxicillin and colistin sensitive micro-organisms, like Campylobacter, Clostridium, Corynebacterium, E. coli, Erysipelothrix, Haemophilus, Pasteurella, Salmonella, penicillinase negative Staphylococcus and Streptococcus spp. in Calves,Goats, Poultry, Sheep and Swine. Calves,Goats and Sheep:Twice daily 5 g per 100 kg body weight for 3 - 5 days. Please note: Before adding to the drinking water make a presolution of 1 kg COMOXY WS per 20 lt. of water with a temperature of 40 °C. Hypersensitivity to amoxicillin and/or colistin. Administration to animals with a seriously impaired renal function. Concurrent administration of tetracyclines, chloramphenicol, macrolides and lincosamides. Administration to animals with an active microbial digestion. Gastrointestinal and respiratory infections caused by doxycycline sensitive micro-organisms like Bordetella, Campylobacter, Chlamydia, E. coli, Haemophilus, Mycoplasma, Pasteurella, Rickettsia, Salmonella, Staphylococcus and Streptococcus spp. in Calves, Goats, Poultry, Sheep and Swine. Calves, Goats and Sheep : Twice daily 5 g per 200 kg body weight for 3 - 5 days. Administration to animals with a seriously impaired hepatic function. Concurrent administration of penicillins, cephalosporins, quinolones and cycloserine. Gastrointestinal and respiratory infections caused by doxycycline sensitive micro-organisms, like Bordetella, Campylobacter, Chlamydia, E. coli, Haemophilus, Mycoplasma, Pasteurella, Rickettsia, Salmonella, Staphylococcus and Streptococcus spp. in Calves, Goats, Poultry, Sheep and Swine. Calves, Goats and Sheep : Twice daily 1 g per 100 kg body weight for 3 - 5 days. Poultry and Swine : 100 g per 500 - 1000 lt. of drinking water for 3 - 5 days. Administration to animals of a seriously impaired hepatic function. Concurrent administration with penicillins, cephalosporins, quinolones and cycloserine. Administration to animals with an active microbial digestion. For meat:Calves, Goats and Sheep : 14 days. Gastrointestinal and respiratory infections caused by micro-organisms sensitive to doxycycline and/or gentamicin like Bordetella, Campylobacter, Chlamydia, E. coli, Klebsiella, Haemophilus, Mycoplasma, Pasteurella, Rickettsia, Salmonella, Staphylococcus and Streptococcus spp. in Calves, Goats, Poultry, Sheep and Swine. Calves, Goats and Sheep :Twice daily 1 g per 20 kg body weight for 3 - 5 days. Poultry and Swine : 1 kg per 1000 lt. of drinking water for 3 - 5 days. Note: for pre-ruminant Calves, Lambs and Kids only; not for use in lactating animals and layers. Hypersensitivity to tetracyclines and/or aminoglycosides. Administration to animals with seriously impaired renal or hepatic functions. Concurrent administration of penicillins, cephalosporins, quinolones and cycloserine. Administration to animals with an active microbial digestion. - For prevention and treatment of CRD, Coryza , Mycoplasmosis, infectious sinusitis, Air succulitis and infectious synovitis. - For cases of stress due to vaccination, debeaking, transport, rehousing, changes of feed and weather etc. - Treatment : 454 gm per 200 lt. of drinking water for 5 days. - Prevention : 227 gm per 200 lt. of drinking water for 5 days. - Safety period: For meat and eggs consumption : 5 days. Or use of the product after expiry date. Gastrointestinal and respiratory infections caused by tylosin sensitive microorganisms, like Campylobacter, Mycoplasma, Pasteurella, Staphylococcus, Streptococcus and Treponema spp. in Calves,Goats,Poultry,Sheep and Swine. 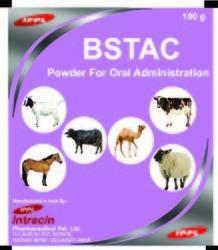 For oral administration: Calves, Goats and Sheep : Twice daily 5 g per 220 - 250 kg body weight for 5 - 7 days. Poultry : 1 kg per 1500 - 2000 lt. of drinking water for 3 - 5 days. Swine : 1 kg per 3000 - 4000 lt. of drinking water for 5 - 7 days. Concurrent administration of penicillins, cephalosporins, quinolones and cycloserine. Administration to animals with an active microbial digestion. For meat: Calves, Goats, Poultry and Sheep : 5 days. Gastrointestinal and respiratory infections caused by oxytetracycline sensitive bacteria like Bordetella, Bacillus, Corynebacterium, Campylobacter, E. coli, Haemophilus, Pasteurella, Salmonella,Staphylococcus and Streptococcus spp. and Mycoplasma, Rickettsia and Chlamydia spp. in Calves, Goats, Poultry, Sheep and Swine. Calves, Goats and Sheep : Twice daily 1 g per 20 - 40 kg body weight for 3 - 5 days. Poultry and Swine : 1 kg per 2000 lt. of drinking water for 3 - 5 days. Administration to animals with an impaired renal and/or hepatic function. Concurrent administration of penicillins, cephalosporins, quinolones and cycloserine. For meat: Calves, Goats, Sheep and Swine : 8 days. Gastrointestinal and respiratory infections caused by oxytetracycline sensitive bacteria like Bordetella, Bacillus, Corynebacterium, Campylobacter, E. coli, Haemophilus, Pasteurella, Salmonella, Staphylococcus and Streptococcus spp. and Mycoplasma, Rickettsia and Chlamydia spp. in Calves, Goats, Poultry, Sheep and Swine. Calves, Goats and Sheep : Twice daily 1 g per 50 - 100 kg body weight for 3 - 5 days. Poultry and Swine : 1 kg per 5000 lt. of drinking water for 3 - 5 days. Administration to animals with an impaired renal and/or hepatic function.Concurrent administration of penicillins, cephalosporins, quinolones and cycloserine.Administration to animals with an active microbial digestion. NEOCIN WS is indicated for the prevention and treatment of bacterial enteritis in Calves, Sheep, Goats, Swine and Poultry caused by bacteria susceptible to neomycin, such as E. coli, Salmonella and Campylobacter spp. 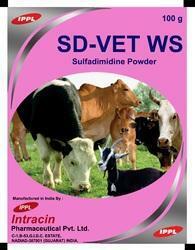 Calves, Goats and Sheep : 10 mg neomycin sulphate per kg body weight (equivalent to 14 mg/kg NEOCIN WS) for 3 - 5 days. Poultry and Swine : 300 g per 2000 lt. of drinking water for 3 - 5 days. Administration to animals with a seriously impaired renal function. Administration to animals with an active microbial digestion. Administration during gestation. Administration to poultry producing eggs for human consumption. Calves, Goats, Sheep and Swine : 21 days. Vitamin A, retinol acetate 7 500 IU. Vitamin D3, cholecalciferol 1 500 IU. Vitamin E, α-tocopherol acetate 5 mg.
Vitamin B1, thiamine hydrochloride 1 mg.
Vitamin B2, riboflavin 2 mg.
Vitamin B6 , pyridoxine hydrochloride 2 mg.
Vitamin B12, cyanocobalamin 7.5 μg. 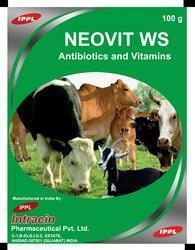 Vitamin C, ascorbic acid 25 mg.
Vitamin K3, menadione sodium bisulphite 5 mg.
NEOVIT WS is a highly effective combination of broad-spectrum antibiotics and vitamins. The product stimulates egg production, increases growth, improves feed conversion and is used as a vitamin supplement during periods of diseases and stress. Gastrointestinal, respiratory and urinary infections caused by oxytetracycline and neomycin sensitive micro-organisms, like Bordetella, Campylobacter, Chlamydia, E. coli, Haemophilus, Klebsiella, Mycoplasma, Pasteurella, Rickettsia, Salmonella, Staphylococcus and Streptococcus spp. in Calves, Goats, Sheep, Poultry and Swine. Poultry and Swine:Prevention : 1 kg per 2000 lt. of drinking water for 5 - 7 days. Treatment : 1 kg per 1000 lt. of drinking water for 5 - 7 days. Calves, Sheep and Goats : 1 g per 5 kg body weight during 5 - 7 days. Hypersensitivity to tetracyclines or aminoglycosides. Administration to animals with a seriously impaired renal and/or hepatic function. Concurrent administration of bactericidal agents like penicillins. Administration to animals with an active microbial digestion. Sachet of 30 and 100 g and jar of 1000 g.
Nematode infections in Horses, Swine, Cattle and Poultry. Horses : Strongylus, Oxyuris, Trichonema and Ascaris. Swine : Oesophagostomum and Ascaris. Cattle : Ascaris, Nematodirus, Ostertagia, Cooperia and Oesophagostomum. Poultry : Ascaris and Capillaria. Horses, Swine and Cattle :1 - 2 g per 10 kg body weight through drinking water. Poultry : 1 kg per 1000 lt. of drinking water for 2 days. Administration to animals with a seriously impaired hepatic and/or renal function. For meat : 2 days. For eggs : 2 days. 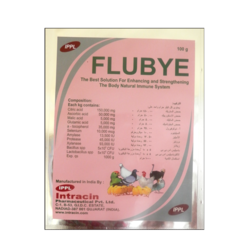 It is used for treatment of Gastro-Intestinal diarrhoea, Respiratory tract infections, Shipping fever in large animals and intestinal coccidiosis in Poultry. 1 g SVK3 WS per 2-4 lt. of drinking water to be given as follows: 3 days treatment, 2 days without treatment, then 2 days treatment. Calves,Lambs and Kids: 1 g SVK3 WS par 5 kg body weight daily for 3-4 days. Animals and birds should not be slaugtered within 10 days from the last treatment. Gastrointestinal and respiratory infections caused by micro-organisms sensitive to spectinomycin and lincomycin, such as Campylobacter, E. coli, Mycoplasma, Salmonella, Staphylococcus, Streptococcus and Treponema spp.in Poultry and Swine, most notably: Poultry : Prevention and treatment of chronic respiratory disease (CRD) associated with mycoplasma and coliform infections of growing poultry susceptible to the action of the antibiotic combination. Pigs : Treatment of enteritis caused by Lawsonia intracellularis (ileitis). water for 5 - 7 days. Swine : 150 g per 1500 lt. of drinking water for 7 days. Note: Do not use in Poultry producing eggs for human consumption. Do not use in Poultry producing eggs for human consumption.Do not use in Horses, ruminating animals, Guinea Pigs and Rabbits.Do not use in animals known to be hypersensitive to the active ingredients.Do not co-administer with penicillins, cephalosporins, quinolones and/or cycloserine. Do not administer to animals with seriously impaired renal functions. Jar of 150 g and 1000 g.
• Restricts the harmful bacteria, increase the micro flora help to prevent the intestinal disease. • Strengthens the body's natural immune system. • Relief of stress due to heat, transport, increase in vital capacity when raising Poultry at high densities. • Improves immunization rate on vaccination. • Quickly reduces the pH value of the gut contents thus helping digestion and absorption of nutrients. Improves effectiveness of digestive system. • Increases the feed conversation rate, promote the fast weight gain. Dissolve in drinking water, use during high risk of sickness. • Poultry :100g/100 lt. of water. • Pet birds: 1g/2 lt. of water. In cases of stress, heat stroke, Post vaccinal and acute bacterial and viral infections associated with high fever. Maintain a health balance of microflora in the intestinal environment. Poultry: 100 gm /200 lt. of drinking water. Sheep & Cattle: 10 gm /100 kg body weight twice daily. Indicated for cankers, giardia and other protozoal infections. Administer 2 teaspoon per quart of drinking water for 5 days.If bird does not impove or condition worsens, consult a veterinarian.